WHO: Supermodel Cynthia Bailey (RHOA) and the Bailey Agency School of Fashion will partner with Show Me the Way Foundation for an All-Star model casting call for children ages 5-17. Children selected will join a host of celebrity kids and their parents for the 2012 Runway Red: Wonderland Safari sponsored by African Pride Dream Kids. 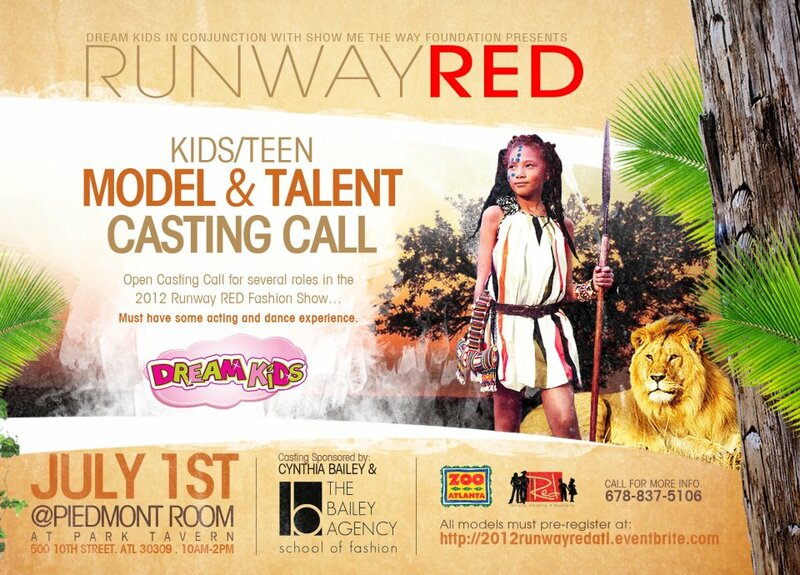 WHAT: The Runway Red Model Call is in preparation for the 2012 Runway Red Celebrity Kids Fashion Show benefiting Show Me the Way Foundation's efforts on HIV/AIDS research on Saturday, August 11, 2012. The fourth annual charity fashion extravaganza is sponsored by African Pride Dream Kids and will be held at ZOO Atlanta. WHY: Children ages 5-17 are needed to join an All-Star cast of celebrities, couture fashions and special surprises for an unforgettable night to benefit HIV/AIDS research. Supermodel Cynthia Bailey will host the model call along with instructors and staff from the Bailey Agency School of Fashion based in Atlanta, GA. Parents and children with inspirations in the modeling industry are encouraged to attend for an opportunity to walk in a high fashion show while gaining beneficial career experience and feedback. All the money collected by at the casting call will be donated to the efforts of Show me the Way Foundation and the Bailey Agency and/or Cynthia Bailey will not receive any profit from the money collected during the fashion show.